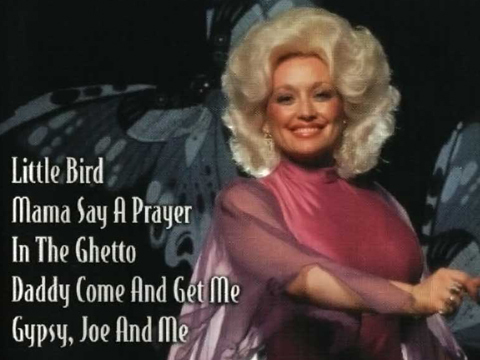 The song, “Just the Way I Am” first appeared on Dolly’s 1970 album, “The Fairest of Them All.” In late 1972, RCA Camden compiled songs from her 1967-1970 recordings. The label wanted to introduce newer fans to these earlier hits. “In the Good Old Days (When Times Were Bad)” was the title cut on her 1968 record. The song reached No. 25 on the US Country charts. “My Blue Ridge Mountain Boy” was the title track on a 1969 release. It climbed to No. 45 on the US Country charts. “Daddy Come and Get Me” was a Top 40 country hit in 1970. “In the Ghetto” from the album “My Blue Ridge Mountain Boy,” peaked at No. 50 on the US Country charts.